Every mailing address is located within a specific county AND a specific ZIP Code. Therefore, if you know what the ZIP Code is for a specific address, you can find out what county that address is located in. All you need is an address validation service provider. Here is a simple example of how to lookup a county using a ZIP Code. We'll also look at an example of how to perform a county lookup using a mailing address. For this example, we'll use the SmartyStreets' address validation demo to find a ZIP Code's corresponding county designation. Step 1. Go to the website of an address validation services provider of your choice. Step 2. Look for "Step 2: Choose a lookup type" and choose "city/state or ZIP Code" from the dropdown menu. Step 3. Enter the ZIP Code in the "ZIP Code" form field of "Step 3"
Step 4. Click on "View Results"
Step 5. In the "Output Fields" section of the results, look for "County Name". There you will see the county associated with the ZIP Code you entered. You can also find county info using this method by submitting the name of a city instead of a ZIP Code. On "Step 3", simply enter the city name instead of the ZIP Code. Step 1. Go to the website of an address validation service provider of your choice. For this example, we'll again use the SmartyStreets' address validation demo for Single Addresses. Step 2. Look for "Step 2: Choose a lookup type" and choose "address components" from the dropdown menu. Step 3. Enter the address info into the respective form fields of "Step 3". You can enter a ZIP Code into the "ZIP Code" field if you want to, but it is not necessary. Step 5. In the "Metadata" section of the results, look for "County Name". There you will see the county associated with the address that you entered. Programatically Finding County Data by Using ZIP Codes. Sometimes, you need to find A LOT of county names for A LOT of different ZIP Codes. Because each individual address is also tied to a specific county, when that address is validated by an address validation service provider, the corresponding county data we be returned to you as well. 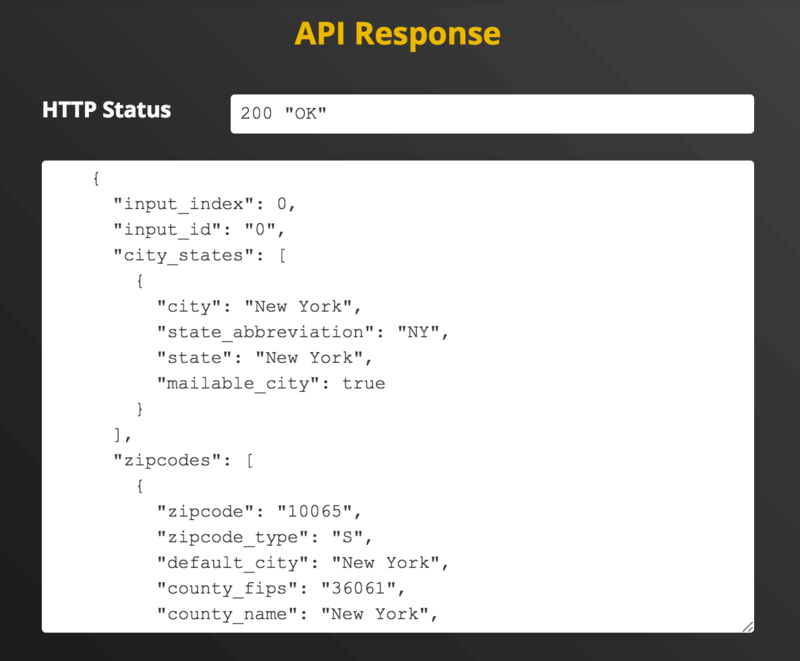 By programmatically accessing the SmartyStreets ZIP Code API, you can submit tens of thousands of addresses in seconds. Our servers will process it in under 30 milliseconds on average and return to you a JSON response with up to 45 datapoints about the address, including the address' county name and FIPS code. The process is facilitated by sending a simple HTTP request to the SmartyStreets ZIP Code API. Complete instructions on how to call the SmartyStreets ZIP Code API, including URL composition, Request Methods, Input Fields and Headers are found in our ZIP Code API documentation.